The day was here, so I had to get up really early to get to Kastrup (Copenhagen Airport) to take a flight to Schiphol (Amsterdam) where a connecting flight should take Mattias and me over the Atlantic Ocean to San Francisco where the Build conference was to take place. Several hours later we arrived at our destination. The positive effect of traveling west is that your day will be longer - nine hours actually, where we were heading. This means that despite the long trip, we still had enough time to attend two meet-ups before night was closing in on us. First we set foot to a "Svenskträff", a meet-up for Swedes hosted by Microsoft's Swedish department, where we mingled and had a relaxing time chatting with other Swedes. Then we went to the Xamarin meet-up, as the guys at Xamarin had promised that they would get all c#-developers well prepared for the upcoming conference starting the day after. And so they did by hosting a good party, we ate a lot of my favorite food - pulled pork sandwiches - which tasted amazingly good. Then we mingled with some other conference attendants, and one thing that we discussed was the number of people attending the conference. They thought it would be "Quite small, let's say about 700". 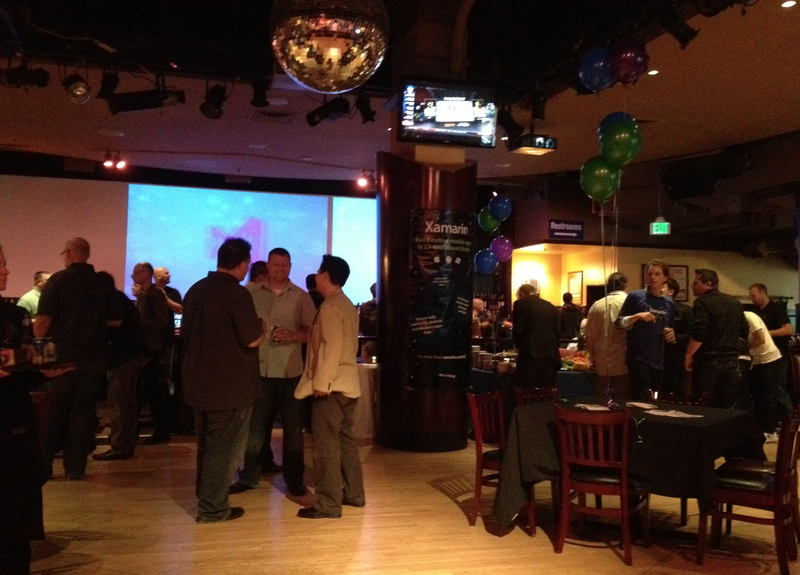 Yeah right… That would mean that at least half of the attendants were at the Xamarin party which obviously wasn't true. Then it started, "Developers, developers, developers, developers, developers…", no - my mistake - that was the video clip, by the same person, which features on the Internet. 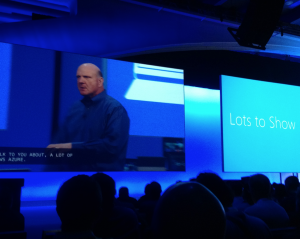 I must say that it was a bit strange to see Steve Ballmer, CEO of Microsoft, appear so close on stage and the weirdest part was that it seemed as if he was the most normal and sanest person on stage. • Jaime Rodriguez brought good news, GIT + TFS == true. 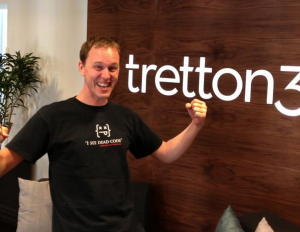 • Scott Hanselman was funny, as expected, and he repeatedly mentioned Nancy, which of course would bring extra joy to some employees at tretton37. • Mads Kristensen was, during his session, publishing Web Essentials 2013 Preview with a lot of useful stuff and he also made it public for contribution so he is no longer the only developer on the project. In the expo hall there was a lot of new cool hardware, like big touch screens, Ultrabooks, phones, tablets, 3D printers and of course the Xbox One, but it was in a glass case and there was a security guard watching over it all the time. As I walked by the JetBrains booth I thought I'd just ask Hadi Hariri when support for TypeScript will be included in ReSharper, and he said that it will not make it in time for the new version 8, maybe later on as an update. Then he very quickly glanced at my t-shirt (the new ninja "tretton37 supporter" t-shirt) and popped the line, "Hey I know a guy that just started working for you, Andreas Håkansson." (way to go again). On Thursday evening there was a big party in a huge warehouse at Pier 48 right by the sea, it had a nice view with the evening sun shining over San Francisco. We were among the first arrivals and it felt a bit empty, but that was good because there was no line for the food, pool tables, air hockey games, football games, or any of the old arcade games and linked racing games, which meant that we got a chance to eat and play some games. Later on when the warehouse was full of people there was a show on stage. It was a guy, sorry but I have forgotten his name, doing some mixture of beatbox, stand up comedy and singing. I had great fun, but we were getting tired and headed back to the hotel to get some sleep before attending the last day of the conference. So last but not least, would I like to go to the next Build conference? The answer is definitely YES! I had a great time and enjoyed it very much, and I hope that all you developers get a chance to do it some time too! THANK YOU TRETTON37 FOR GIVING ME THIS OPPORTUNITY!